Developing countries have made great strides to reduce hunger since 1990, but have failed to meet major international goals. Many children, for example, are still underweight due to diseases caused by dirty drinking water and unbalanced diets. Click image to enlarge. The number and proportion of people not eating enough calories declined significantly over the past two decades, according to a global food security report released this week by the United Nations Food and Agriculture Organization (FAO). But despite the millions of people now consuming more food, world leaders failed to achieve the two main international targets for reducing hunger. Extreme weather, economic downturns, high food prices, conflicts, and insufficient access to clean water and sanitation hampered progress, according to the report. Approximately 10.9 percent of the world’s 7 billion people are undernourished, meaning that the world almost reached the UN’s Millennium Development Goal (MDG) to cut the proportion of hungry people in half between 1990 and 2015. An estimated 18.6 percent were categorized as hungry in 1990. Leaders also fell short of a separate, stronger international goal, set at the World Food Summit in 1996, to halve the absolute number of hungry people by 2015. 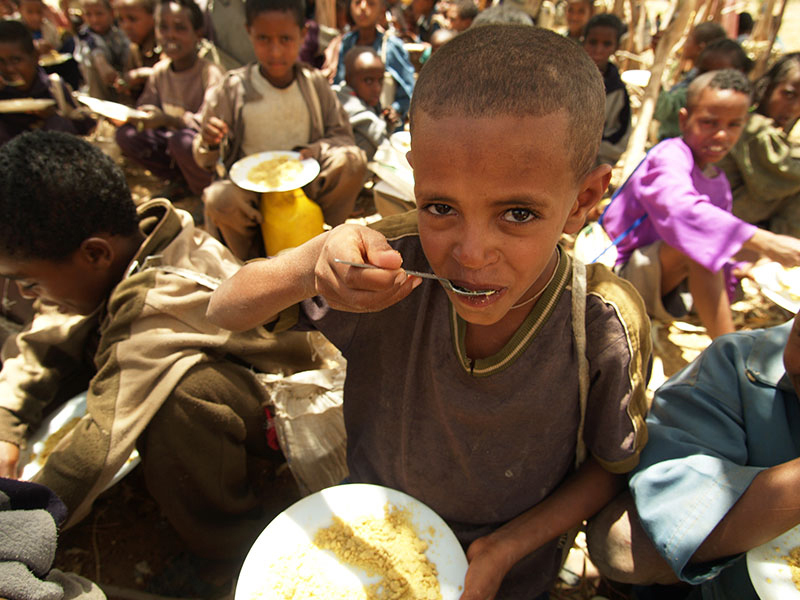 The number of hungry people — about 795 million today — is only 21.4 percent less than in 1990. Progress varies by region. Eastern Asia, Southeast Asia, and Latin America made the largest strides in reducing hunger, thanks to fast-growing economies or generous social-welfare programs, while Southern Asia and Sub-Saharan Africa lagged. Overall, 72 developing countries met the Millennium Development Goal for hunger, but only 29 of those achieved the more difficult World Food Summit goal. The FAO report points to a number of factors that slowed efforts to reduce hunger, among them natural disasters like droughts and floods. Between 2003 and 2013, major natural disasters caused at least $US 13 billion in losses for the agricultural crop sector and $US 11 billion in losses for the livestock sector, according to an FAO review of disasters in 48 developing countries. Crop and livestock losses not only directly affect the ability of communities to feed themselves. Farm losses also cut into the household income needed to buy food, health care, and other essential items. For example, droughts played a large role in a 2011 famine in the Horn of Africa and again in a 2012 food crisis in Africa’s Sahel region. In addition, the report notes that natural disasters can spur conflicts, which further erode food security. Scientists expect that natural disasters will become more frequent and intense as the planet warms. “Taken together, exposure to natural disasters, exacerbated by climate change, can pose significant challenges to countries in their progress towards the international hunger targets,” the report’s authors wrote. Even when enough food is available, polluted water and inadequate toilet facilities can lead to malnutrition, especially in children. The share of underweight children — a second indicator used to measure hunger — declined by nearly 40 percent globally since 1990. In regions including Southeast Asia, Oceania, and Sub-Saharan Africa, however, too many children have low body weights because of diseases linked to a lack of clean water and sanitation, in addition to a diet that does not provide essential vitamins and nutrients. The report acknowledged that improving water access, sanitation, and hygiene (WASH) often requires more substantial infrastructure investments than increasing the availability of food, but WASH is a necessary step to achieving food security.